MACON, Ga. – Georgia Farm Bureau (GFB) recognized the best of the organization’s volunteers and county chapters during its 80th annual convention on Jekyll Island. The state award winners were honored for the programs they conducted this past year to promote agriculture. Thomas and Alicia Harrell of Madison County received the GFB Young Farmer Achievement Award, which recognizes young farmers who earn most of their income by farming. The Harrells, who operate Over Jordan Farm, are first-generation farmers who raise poultry and cattle and grow hay. They also own a business making and installing livestock handling equipment. As the state winner, the Harrells received a side-by-side utility vehicle sponsored by Southern Farm Bureau Life Insurance, a $500 cash prize from AgSouth Farm Credit and an expense-paid trip to the American Farm Bureau Convention in Nashville, Tennessee, Jan. 5-10, 2018, to compete for national honors. Will Godowns of Pike County was recognized as the GFB Young Farmer Discussion Meet winner and will enjoy an expense-paid trip to the AFBF Convention in Nashville to compete for national honors, courtesy of GFB. The discussion meet is intended to simulate a committee meeting during which agriculturalists discuss issues affecting agriculture. Godowns received an all-terrain-vehicle courtesy of Southern Farm Bureau Life Insurance and a $500 cash award courtesy of GFB. Josh and Skye Pennino of Hancock County won the Young Farmer Excellence in Agriculture Award. GFB presents this award to recognize young farmers who earn most of their income from something other than production agriculture. Josh works as a livestock auctioneer and livestock relocation specialist. Skye is an assistant district attorney in the Ocmulgee Judicial Circuit. The couple also raise cattle and grow hay. As the state winners, the Penninos received an all-terrain vehicle sponsored by Southern Farm Bureau Life Insurance and an expense-paid trip to the American Farm Bureau Convention to compete in the national contest. CLICK HERE to download accompanying photo. CUTLINE FOR PHOTO: Georgia Farm Bureau (GFB) honored county Farm Bureaus for promoting agriculture and individual members for personal achievement during the organization’s 80th annual convention. 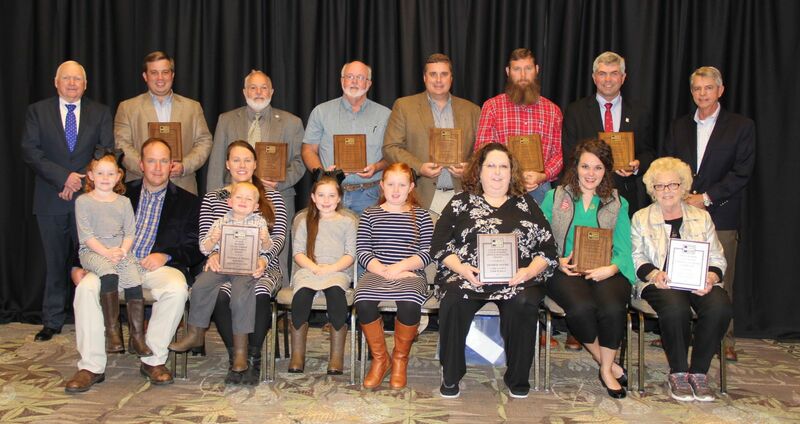 GFB President Gerald Long (back row, far left) congratulates the 2017 GFB award recipients: (front row, from left) GFB Young Farmer Achievement Award winners Thomas and Alicia Harrell of Madison County with their children Annabelle, Luke, Abigail and Augusta; GFB Outstanding Office Manager Debbie Payne of Cobb County; Caroline Lewallen accepting the GFB Outstanding Young Farmer Committee Award for Hall County Farm Bureau; Mary Jones accepting the GFB Outstanding Women’s Leadership Committee Award for Hall County; (back row, second from left) GFB Young Farmer Discussion Meet Award winner Will Godowns of Pike County; Andy Garland accepting the GFB Outstanding Legislative Committee Award for Henry County Farm Bureau; Randy Usher accepting the GFB Outstanding Promotion & Education Committee Award for Toombs County Farm Bureau; Chris Hopkins accepting the GFB McKemie Award for Toombs County in the medium membership category; Marcus South accepting the GFB McKemie Award for Upson County Farm Bureau in the small membership category; Jerry Truelove accepting the GFB McKemie Award for Hall County Farm Bureau in the large membership category; and GFB Hay Contest Winner Eddy Turner of Washington County.